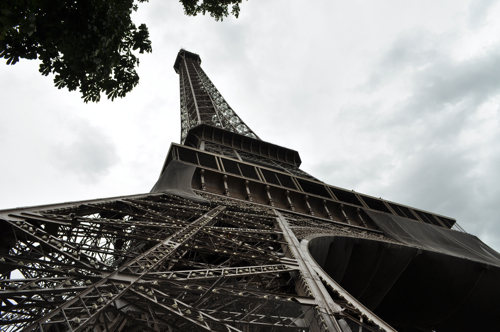 With around 7 million paying visitors annually, The Eiffel Tower is the most visited building worldwide. And you might ask, do I really have to pay it a visit? Yes, you do. 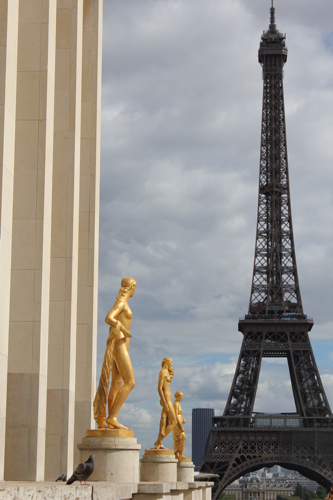 You absolutely have to experience it, because it’s Paris in a nutshell: Elegance, beauty, timelessness. You've probably seen tons and tons of pictures of the Eiffel Tower; you might have even seen duplicates like the ones in Shenzhen or Tokyo. But, believe me, once you see it for real, it will surprise you. Who couldn’t immediately feel the majesty and poetry of this monument? 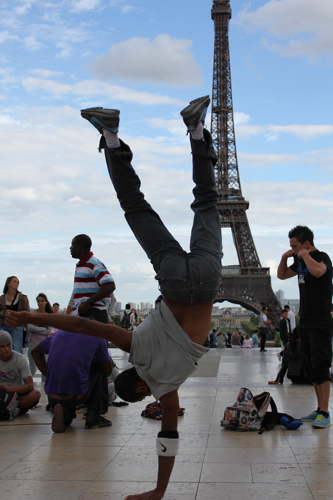 The best way to get to it is from Place de Trocadéro. You’ll be a bit higher up and will enjoy the most stupendous view: here it is in all its beauty, a 324-meter high tower, old and elegant, an iconic monster, a symbol of Paris, only changing its mood with the changing of the weather. Maupassant wasn’t alone in his opinion and several writers and artists signed a protest letter complaining about “a tower of ridiculous vertiginous height dominating Paris, just like a gigantic black factory chimney, it's barbarous mass overwhelming and humiliating all our monuments and belittling our works of architecture, which will simply disappear before this stupefying folly“. Happily, people got used to the monster and later the invention of the radio saved the Eiffel Tower. The first transoceanic radio contact was made from here. And until today the top of the tower still hosts television antennae and a meteorological station. Seven million visitors are a lot, I agree. But you can choose the right time to visit and buy tickets online. It’s worth doing. Because if you want to go up the top (3rd level), you have to change lifts, which means queing up for around another 20 minutes on the second platform. (The same for going down again). If you skipped your daily workout that morning, why not try the 1665 stairs in the south pillar, which will bring you up to the second platform? There, by the way, you can hire an iPod with the Official Guide for 7 Euros which will give you a lot information and point out all the important monuments visible from the top. When's the best time to visit the Eiffel Tower? 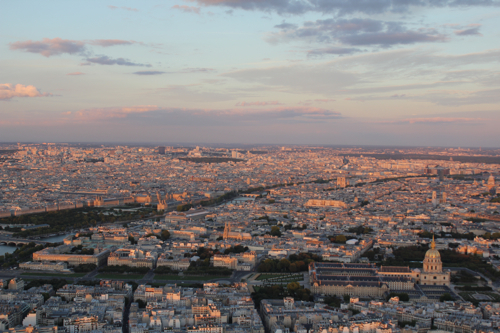 Come in the early evening, just before sunset, and you will have the most astonishing view over Paris, when the dense urban fabric is bathed in colour. On a clear day views can reach to approximately 65 km (40 miles). Can you see the Trocadéro with a small cemetery just behindit (le Cimetière de Passy)? Did you realize just how big the Louvre is? And did you spot the new museum on the Seine bank, the Musée du Quai Branly? 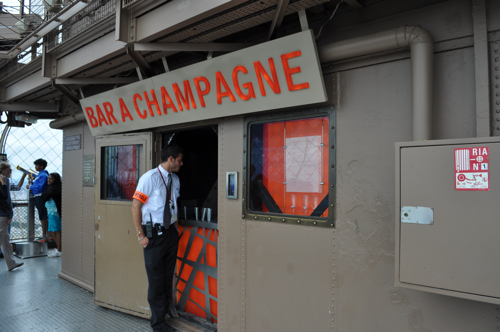 Why don’t you have a glass of Champagne at the new Champagne Bar at the top level and kiss (or be kissed) because, don’t forget, you’re in Paris. Or do it like Rod Stewart who proposed his long-time girlfriend Penny Lancaster down on his knees on top of the Eiffel Tower (she's pregnant with their second baby now). Then have dinner at Le Jules Verne, one of the numerous restaurants under the management of Alain Ducasse (where you pay for view and reputation, of course). The other advantage of a late visit is: Once you’re back down on earth, you can enjoy the spectacle of the sparkling tower. Pretend to be a magician, ask you friend or you wife or husband or whoever is with you to close their eyes and to open them on the hour. The tower will be sparkling! 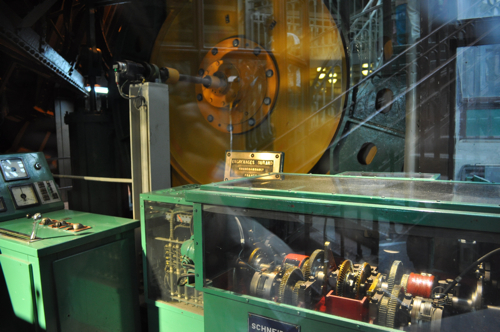 Now you can tell tjem that the 20 000 bulbs twinkle for five minutes at the beginning of each hour (until 1 o'clock). What more do you need ? After sparkling wine, a sparkling tower. We’ll always have Paris!